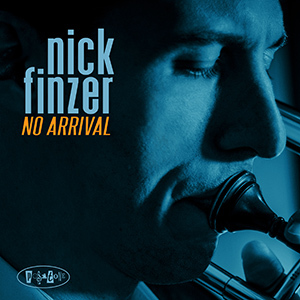 Trombonist/educator/composer/arranger/bandleader Nick Finzer might be a member of Scott Bradlee’s Postmodern Jukebox but he’s still that same teenager who entered the annual “Essentially Ellington” competition at the “Jazz At Lincoln Center” series. On No Arrival (Posi-Tone), his tone is positive with swing, post-bop and the kind of. His originals are daring. They poke, prod and push his sextet to satisfying heights on music from Prince (“The Greatest Romance Ever Sold”), Leonard Bernstein (“Maria”), George Gershwin (“Soon”) and, of course, two solid and satisfying doses of Ellingtonia. Props to the swirling tenor sax and bass clarinet of Lucas Pino who serves as foil for Finzer’s ‘bone while a rampaging piano/guitar/bass/drums keeps things hopping.